Country Apple Orchard farm is a family owned and operated business. Our “pick your own” apple orchard is located in beautiful King City. 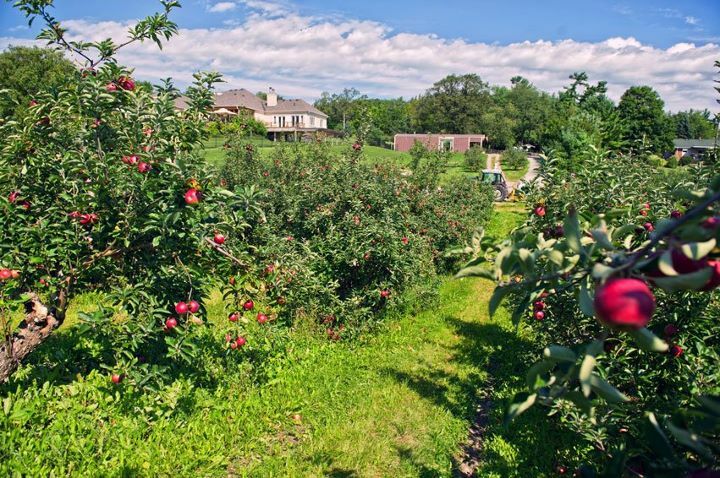 Enjoy a peaceful, relaxing country day on the orchard with manicured grassy rows of “dwarf” apple trees. With approximately 5000 trees, that have been producing apples for over 27 years. There are ten different varieties of apples for you to pick and enjoy. Apple varieties that are available to be picked by mid to late August are Tydeman Red, which is our sweet & juicy summer apple followed by the children’s favorites; Macintosh and Courtland start the harvest season. Also grown are Spartans, Red Delicious, Jonagold, Mutsu/Crispin, Russets, and Northern Spy, the favorite in apple pies. We provide environmentally friendly apple bags for an additionial charge, and have pre-picked apple bags that you may purchase at our apple barn. Available for purchase at our apple barn are freshly baked apple pies, fresh sweet pasteurized 100% apple cider, local unpasteurized honey, pumpkins and other local farm fresh seasonal produce. For more information please call 905 833 3434 or visit the website.